When I cleaned out our garage last weekend, I came across an old box of stuff that I have been shuffling around for years without ever opening it. 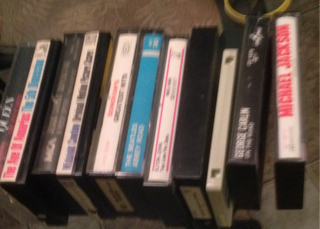 This time, I opened it and found a pile of old pictures and these tapes. They looked to be mostly from the 70's and I was delighted to find them even though I no longer own anything capable of playing them with any fidelity. Why? Because I knew that I could find all of the songs at Amazon Prime Music. Literally millions of albums and songs are there and can be listened to on almost any device you own and streamed to our Amazon Echo. I've mentioned before that I'm not a big music fan. I like some of it, but could cheerfully live without it if necessary. Still, these songs from our childhood and early years of marriage trigger many memories for both of us. Whenever my wife or I think of some old song from our youth, we go to Amazon to find it. It's almost always there in Prime and in the rare case when it isn't, a dollar or two will buy it. Currently, we have over 800 songs from Prime Music and sometimes enjoy listening to the oldies while we work. Amazon Prime is a good buy even without this, but Prime Music really makes it a no-brainer for us.